Lucideon, the construction testing organisation, is hosting a free-to-attend webinar, ‘Transportability Assessments of Modular and Volumetric Buildings’ on Tuesday 14 May 2019 at 15:00 UK time (10:00 EDT). 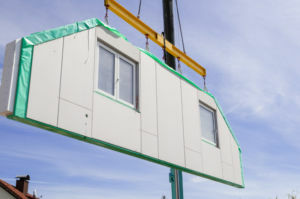 During the design stage of offsite modules and panels, the transportation, storage, handling and installation processes must be considered as it may be necessary to incorporate additional components and/or materials. If the transportation, storage, handling and installation procedures are overlooked at the design stage, the condition of a building after onsite construction may be compromised both structurally and environmentally. Once a modular and volumetric building has been manufactured, should the finished structure sustain damage, the effects can be monitored and assessed. The results can be used to redesign the post-manufacture logistics or the modules and panels themselves. “There is still little guidance and very few standards available in the growing offsite and modular sector for designers and manufacturers. As such, innovative and customised systems are often created without full consideration given to the logistics and transportation of a factory-manufactured building to site, or onsite installation. The webinar will examine all aspects of transportability for modular and volumetric buildings, from the design, benchmarking and instrumentation choices, to measurements and performance parameters. A case study will also show how a panel manufacturer valued engineered their products for transportability. Find out more and/or register to attend the webinar here.